Dhoom starts with a bang, and continues with a lot more right until the end. The tale begins in Mumbai where a sophisticated gang of robbers is sweeping through the city, giving nightmares to the police department. They come like wind, sweep the place and disappear on their hi-tech bikes - the slickest and fastest riding machines on the road. Jai Dixit (Abhishek Bachchan), an honest police officer is brought in on the case. Soon he is on the trail of the robbers - a gang headed by Kabir (John Abraham), an evil perfectionist with an attitude. Jai ropes in the services of Ali (Uday Chopra), a happy-go-lucky garage mechanic and a prodigious bike rider. The two don’t get along at first, but soon Jai realizes that the clown can ride bikes like the wind and decides to team up with him to try and bring the robbers to justice. Kabir soon catches up on Jai-Ali’s teaming up and his arrogance pushes him to take up the challenge openly. From the mean streets of Mumbai, the chase shifts to the sun kissed beaches of Goa. And so starts the hunt…where sometimes the hunter becomes the hunted. Dhoom reinvents the classic cops and robbers tale and brings it into the 21st century. 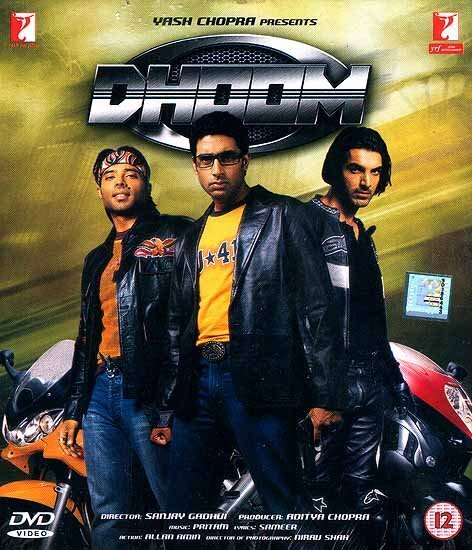 With fast bikes, big action, non-stop fun and a thrilling story that leaves you out of breath, Dhoom is a powerhouse of adventure and excitement waiting to explode. It’s like your favourite roller coaster ride…once you’re on, the only thing you want to do is to go back and take that ride all over again! Come…let DHOOM take you to the ride of your life! Single Disc2.35:1 Widescreen Presentation 5.1 Dolby Digital Sound, Theatrical Trailer, Alternate End, Dhoom: The Making, Dhoom Dhoom (Tata Young Video), T. T. Promos, Optional Subtitles: English/Bengali/Gujrati/Tamil/ Telugu/Kannada/Malayalam.